Virtual reality helps alleviate the pain of immigrants kept apart from loved ones. As an undocumented immigrant living in Los Angeles, Galdys has been separated from her family in Lima, Peru, for 23 years. “Mamá,” was all she could mutter when she saw her mother, re-created in virtual reality, sitting calmly on a couch in her childhood home. Galdys’s experience is one of more than 15 “virtual reunions” that the Family Reunions Project—a small team that produces virtual reality footage for undocumented immigrants and their families abroad—has organized to date. 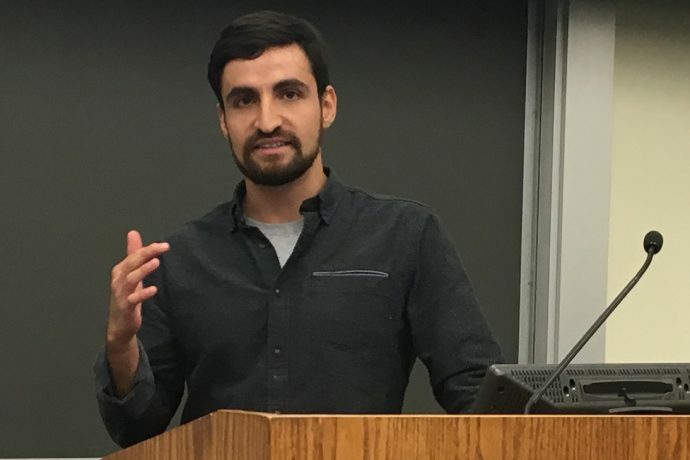 “We are trying to facilitate these family reunions via what we call virtual postcards,” Alvaro Morales (above), co-founder of the project, said at a presentation at Boston College Law School on March 21. The idea is simple. Morales and his team travel abroad to film 360-degree videos for those who are unable to return home. The recipient then views the message wearing a 3D headset that tracks their head movement. This creates an illusion of stepping into one’s old neighborhood or home and sharing the same space with friends and family members from whom they’ve been separated for decades. But because this mirage can feel so real, Morales said his team “learned the hard way” to be careful not to inflict trauma on the viewer. Now his team exposes the recipient first to neutral content—such as a VR tour of a tourist location—to lessen the potential shock. They also coordinate with the families to talk over the phone after viewing a virtual postcard whenever possible. However, Morales, a Peruvian immigrant and former Deferred Action for Childhood Arrivals (DACA) recipient, stressed this project is “merely a BAND-AID.” He said his team not only hopes to mitigate the physical deconstruction of families by using technology, but also to shed further light on the realities of family separation by sharing the footage of these reunions. Like Gladys, many of the roughly 11 million undocumented immigrants in the US are unable to return home and lack a path to citizenship because they have been staying in the country unlawfully. President Barack Obama’s DACA executive order had provided temporary protection for qualified young immigrants like Morales, who arrived here at a very young age, from prosecution and deportation. However, the program instituted in 2012 was terminated by the Trump administration in 2017. Efforts continue in Congress to provide a permanent pathway to citizenship for DACA and Deferred Enforced Departure recipients, and temporary protected status holders—albeit slowly. 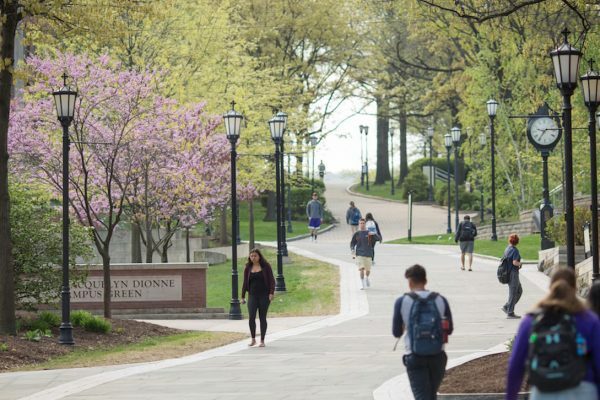 “Presence is not lost because of distance,” said anthropologist Gabrielle Oliveira, an assistant professor at Boston College’s Lynch School of Education, speaking at the same presentation. Originally from São Paulo, Brazil, Oliveira studies transnational motherhood, separated siblings, childhood, and the education of migrants to the United States. Despite the political push for constructing border walls between Mexico and the United States, Oliveira said, immigrant families remain emotionally connected through various forms of technology—whether it be Facebook, FaceTime, or even video games like Call of Duty. Still, she said, many immigrants experience difficulties maintaining their cultural identities, and immigrant mothers often suffer from the guilt of leaving some of their children behind. 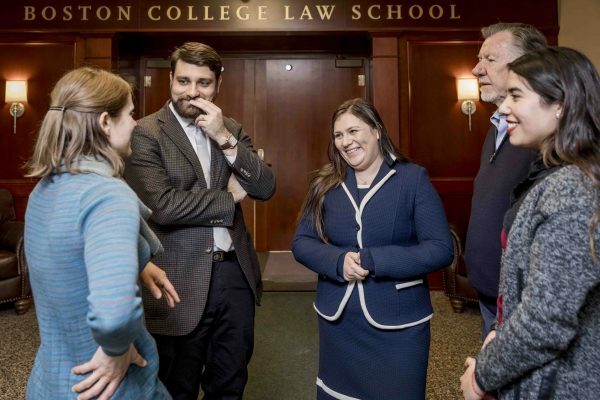 Co-hosts of the March 21 event “Family Separation and Virtual Reality: Connecting Families Separated by Physical Borders” were the Law School’s Immigration Law Group, Intellectual Property & Technology Forum, Latin American Law Student Association, and Boston College Law Democrats.